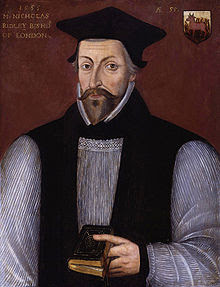 Nicholas Ridley, Bishop of London, burned at the stake as one of the Oxford Martyrs for his teachings and his support of Lady Jane Grey. The sentence was carried out on 16 October 1555 in Oxford. Ridley burned extremely slowly and suffered a great deal, despite packets of gunpowder put under his arms. He burned alongside Latimer, who is reported to have said to Ridley, "Be of good comfort, and play the man, Master Ridley; we shall this day light such a candle, by God's grace, in England, as I trust shall never be put out."